In a medium bowl, stir peanut butter and sugar together until smooth. Beat in the eggs, one at a time, then stir in the baking soda, salt, and vanilla. Roll dough into 1 inch balls and place them 2 inches apart onto the prepared cookie sheets. Press a criss-cross into the top using the back of a fork. 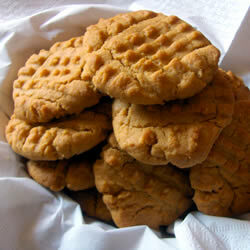 This entry was posted in Food and tagged baking, best peanut butter cookies, delicious, festive, home baked, peanut butter cookies, simple recipe by Miss P. Bookmark the permalink.